Color is the first giveaway you’re looking at a Julia Deckman oil painting. 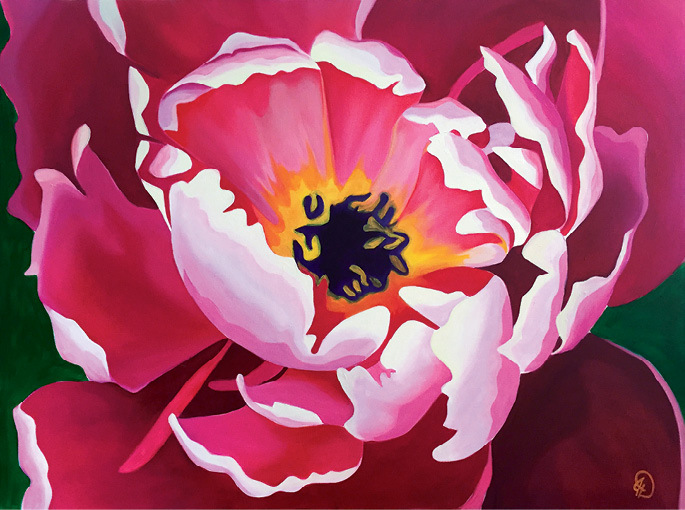 Because whether the James Island artist is capturing a beloved pet, a Charleston storefront, or a dramatic bloom, her palette is bright and downright tropical. Born in Maryland, Deckman attended College of Charleston, where she received a degree in anthropology. Post-graduation, she worked a few office jobs while building her art business, and when the perfect studio space opened up at Redux Contemporary Art Center, she snagged it. This January, Deckman became a full-time creative, augmenting her painting career by teaching courses at Redux and working at Artist & Craftsman. Catching the bug: One of my earliest memories is from when I was about three at my grandfather’s house in Maryland during one of the summers that all the cicadas emerged. I remember standing at my easel, picking up bugs, painting on their shells, and then releasing them. Pet project: I’m obsessed with animals. When I work on a commissioned portrait, I ask clients for as many pictures as possible that capture the animal’s personality. I like open-mouth photos, goofy faces—but the eyes are most important. I love when a client allows me to go wild with color. Singular style: My goal is to keep growing as an artist. Some stylistic aspects will change and evolve, but I’ll always be inspired by light and vibrant colors. I have to create work that’s interesting to me—not work that’s on trend. The “Sill Series:” I started it recently because I wanted to combine botanicals with architectural lines. After a while, I realized I was really just painting window nooks from my dream home. My husband, Dylan Mauerhan, and I live in Riverland Terrace—I love our house, but it’s small. Painting is a way for me to have it all. 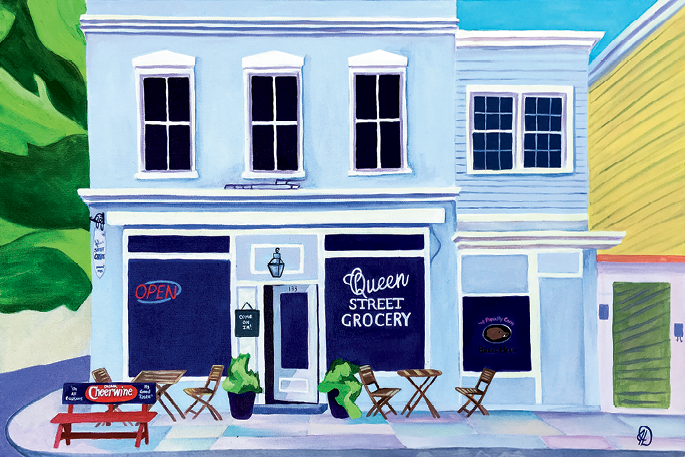 Queen Street Grocery is from her Charleston Hospitality Series of prints and note cards sold at Skinny Dip Charleston. See more of her works at www.byjdeckman.com. On teaching: I was hesitant since I don’t have a formal arts education, but then I realized that I could potentially relate well to adults looking for new ways to be creative. There are some days I regret not going to college for art, but at that time in my life, I was very insecure, and I might not have survived all the critiques and judgement. I’m glad to have the perspective I do. Next steps: As a nod to the beginning of my creative path, I’m planning a series of enlarged, 3-D, wall-mounted cicadas painted with my signature bright colors.